The Patriots have to fill a gaping hole at tight end. Here are five tight ends that they could target in free agency and the draft. 1. Austin Sefarian Jenkins, UFA: The veteran tight end is the best remaining tight end on the free agent market. He has had success against the Patriots in the past so Bill Belichick is familiar with him. Jenkins is a good run blocker and a reliable target, particularly in the red zone. 2. Irv Smith. 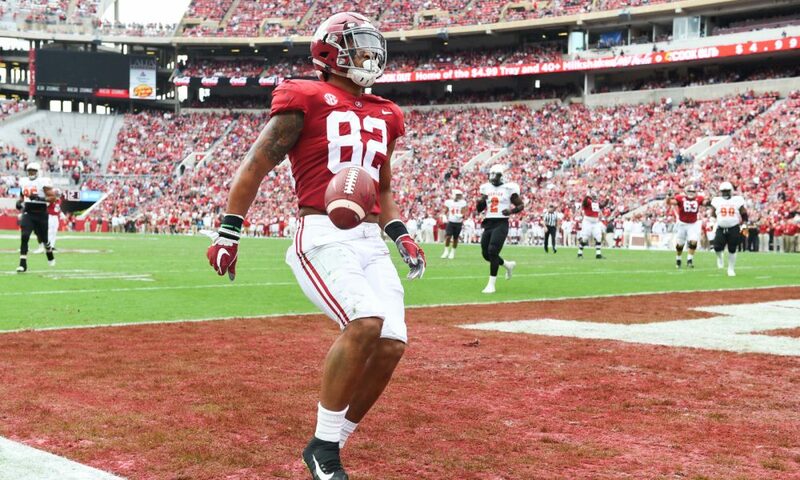 Alabama: Smith is the Patriots most likely option with the 32nd pick of the first round if they decided to take a tight end. At 6-2 242, he is not as big or as physically gifted as Gronk but Smith is a good blocker and he runs good routes, especially vertically. Smith is a more athletic version of Daniel Graham. 3. Jace Sternberger, Texas A&M: Sternberger has good size at 6-4 251. He can create match-ups as a detached tight end and is a weapon in the red zone. He does a great job of winning one on one match ups and high pointing the ball. 4. Dion Sims, UFA: The veteran tight end has been a career underachiever but he reminds me of Martellus Bennett before he came to New England. Sims has good size, is a decent blocker and he can create match-ups in the red zone. He is effective mostly as an in-line player but he can be detached and used as a split end or slot. 5. Luke Willson, UFA: Willson has good length and has been predominately a move tight end in his career. Willson is not a starting tight end but he could be a second or third tight end or a camp body. 6. Lance Kendricks, UFA: Kendricks is also a move tight end. He is undersized but he runs good routes and can create match ups versus nickel corners and linebackers. Kendrick also profiles as a second or third tight end. 7. Foster Moreau, LSU: At 6-4 253, Moreau has requisite size and the physical tools to be a starting tight end in the NFL. He is pretty athletic even though it doesn’t always show up on film. He can be a bit sluggish at times in his route breaks but with more work and a prominent role, Moreau could develop into a starting tight end. 8. Drew Sample, Washington: Sample is 6-5 255. He is your classic Y tight end. He can play in line or be detached. He ran a 4.71 forty at the combine so he lacks explosion. He is an above average blocker however who runs a basic tight end route tree and has upside. 9. Dax Raymond, Utah State: Raymond is very similar to Drew Sample. Raymond is also 6-5 255 and more built to play in line as the Y tight end. Like Sample, he runs a limited route tree and is effective one on one at creating match ups. A lack of explosion and an ability to separate limit Raymond’s upside. 10. Antonio Gates,UFA: Gates wants to stay in Los Angeles but Belichick knows he can dangle the winning carrot with veterans like this. It is not out of the realm of possibility.